We married in mid 2010. We were batchmates, then best friends turned life partners. We were doing our FCPS training in medicine back then and had to spend a lot of time in the hospital. In about four months I got ill. I had frequent fevers but it was assumed that it might be because of the workload. But I was deteriorating each day. My temperature rose to 104-105 degrees and I also developed urinary retention. No diagnosis could be made. After MRI, the doctors assumed that it might be a case of CNS tuberculosis. My condition was deteriorating drastically. My speech was slurred and I also had periods of memory loss. I couldn’t recognise my family members,not even my wife. After getting the treatment for tuberculosis and taking steroids, my condition got better and I shifted home. But around this time I first had some symptoms of paralysis. Finally it was decided that I’ve to be taken to Singapore for treatment. I face many difficulties, among them raising the money required being the principal one. At that time, I had weakness in my legs and had to be taken to Singapore in a wheelchair with a catheter. During this period, Nafisa was my constant companion. She played a major role in looking after me and taking me to the doctors. The doctors advised me to continue the treatment in India. Here I was given physiotherapy besides medication and my condition improved. I used a walking stick to walk around. We returned home in the middle of 2012. Nafisa and I passed MRCP part 1 and 2 in the meantime. At the end of 2012, my condition again deteriorated. At last it was diagnosed in Singapore that I had Syringomyelia, a rare disease of the spinal cord. I underwent spinal surgery a few times but it didn’t help that much. Now I had serious neuropathic pain in my whole body. We tried everything, even strong opioids and high dose steroids, but it couldn’t be controlled. As a last resort, a machine has been implanted in my abdomen which directly pumps morphine in my nervous system. Given my present condition, I can’t go back to my normal life again. The current treatment plan is to contain the disease and symptoms as much as possible. The main reasons of my making it this far are my wife and parents. My parents are also DMCans and they too have married out of love. For almost two years I was bedridden. I couldn’t sit up by myself and rarely saw sunlight. 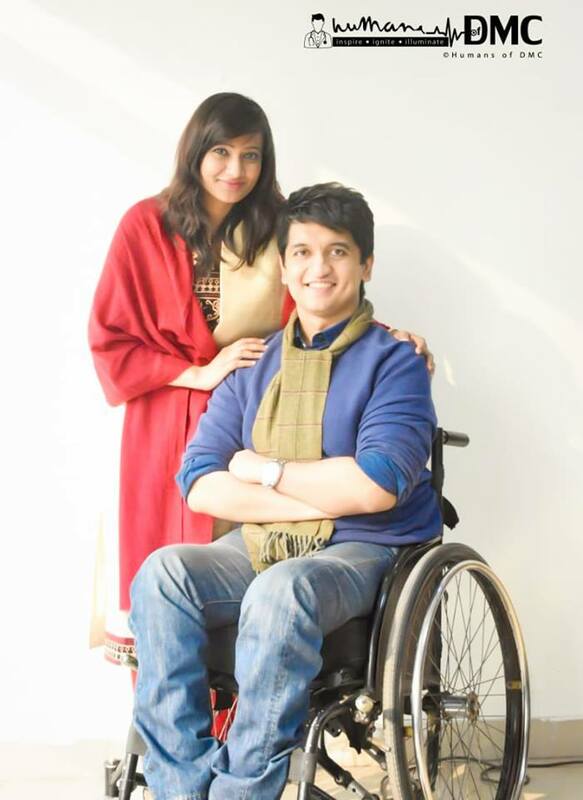 In those times, Nafisa’s presence and care kept me alive. After giving it much thought, I had told her to leave me. I’ve faced death on quite a few occasions and didn’t have much hope for the future. But Nafisa didn’t leave me behind. I never felt that I was fighting the battle alone. Nafisa fought alongside me, sometimes sacrificing even more than me. One time I developed severe anemia where my hemoglobin level fell below four. That time, Nafisa donated me blood to save my life. Even after going through all this, I’ve completed my post graduation and for that Nafisa deserves the most credit. I never gave up on life. While taking care of me, Nafisa has lost some four years of her academic career. I encouraged her to pursue it again. Nafisa decided to appear for MRCP final part exam and entered my name too. So I had to take the preparations. During that time, I had to face many physical challenges. I had to endure severe pain and Addison’s crisis. My blood sugar fell below three and blood pressure was low too. I had to keep these in control my taking high dose of steroids. In 2017, Nafisa and I passed the MRCP exams. Now I do chambers, attend to patients regularly. Nafisa never gave up on me and she had made me believe that good times can come even after the darkest of hours. It’s because of her that I still hope for a better future and find the will to live despite so many difficulties. Love can conquer everything, my wife is the living proof of that.